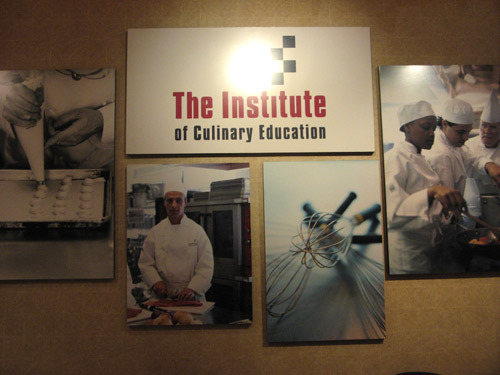 Two Christmases ago, I received a gift certificate to the Institute of Culinary Education in Chelsea, but it was not until this week that I finally was able to make use of it. Although I’d decided almost immediately on the particular class I wanted to take from among the 1700 Recreational Division offerings, the small class sizes made finding an open evening session that fit into my schedule a bit of a challenge. But at last, here I was. As I waited for the session to begin, I checked out the Institute’s glass case exhibit of antique kitchen implements. 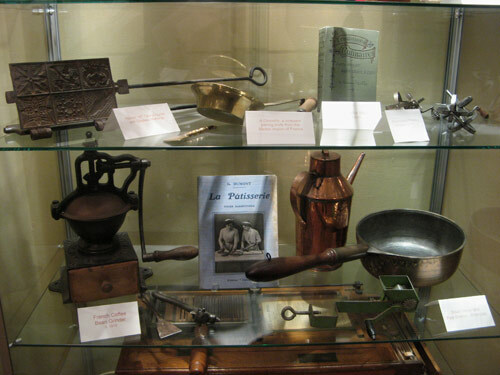 The cookbooks and coffee mill I recognized, but a few of the other items…? 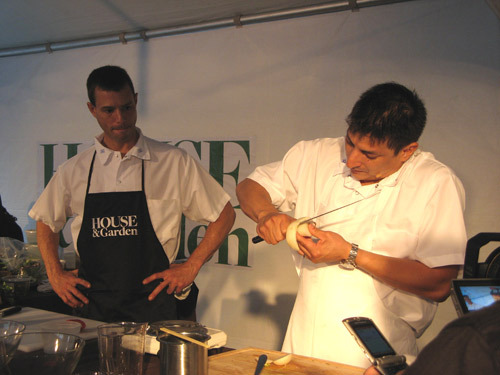 Knowing how to use knives skillfully is critical for cooks, yet many people have never mastered proper technique. Similarly, good knives form the foundation of a well-equipped kitchen, yet even some accomplished home cooks don’t know how to select and care for them. In Knife Skills 1, you’ll use Wüsthof-Trident knives to slice, dice, and chop in the safest and most efficient manner. You’ll also learn the proper way to sharpen your knives. Living on my own, I do a fair amount of cooking at home — which is perhaps not evident from this blog — so naturally, I’m no stranger to using knives in the kitchen. At least I was probably in a better position than one of my fellow students — dragged to tonight’s class by his girlfriend — who when quizzed about his home kitchen knife collection, sheepishly admitted, “I have a butter knife.” Up until now, I’d managed to get the necessary jobs done without causing any serious injury to myself or to others, but I’d always had the nagging suspicion that there were ways I could improve my technique. Tonight’s class was led by chef-instructor Norman Weinstein, who has been teaching essential techniques for more than two decades. 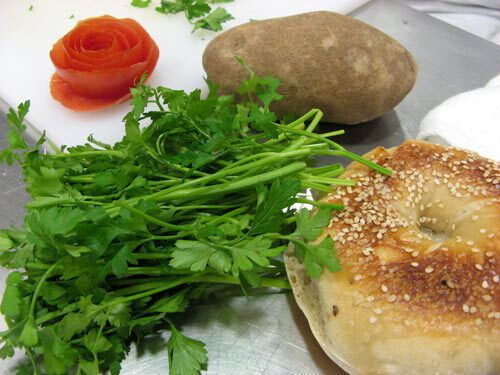 In addition to the four knife skills classes at ICE (from “Basics” to “Decorative Garnishes”), Weinstein leads two Chinese cooking classes (Sichuan and Cantonese). His book on Mastering Knife Skills is due out in March 2008. Our group of 12 was made up of 6 men and 6 women tonight, which the instructor observed “almost never happens.” (It seems that these classes are overwhelmingly populated by females, so for any eligible bachelors who may be reading this, infer from that what you will.) After donning our white ICE aprons and name tags, we were set up at individual workstations laid out with a gleaming selection of Classic Wüsthof knives: chef’s knives, a utility knife and a paring knife. The three hours we spent watching and learning to use the knives were an epiphany. According to Weinstein, the biggest mistakes people tend to make when using knives are using the wrong type of knife for the task, and handling the knife incorrectly. (Apparently, I’ve been guilty of both.) And where previously I’ve been hesitant to invest in any knife larger than 8 inches — small girl hands! — the 10 inch chef’s knife was a revelation. Weinstein put us through the paces halving a bagel, slicing up celery and carrots, then dicing potatoes and onions, mincing shallots and garlic, chopping herbs, and finally peeling. (Check out the tomato skin rose garnish — fancy!) Different techniques all, requiring different motions with the blade, which were not immediately obvious without specific instruction. But what an improvement! Also covered: knife sharpening (which is best left to the professionals) and blade honing with a misnomered “sharpening steel.” Check out Alton Brown’s “Good Eats” segment on sharpening vs. honing, which covers a lot of the same points. Chefs can be rabidly devoted to their knives — this Times piece by the brothers Lee also happens to includes a photo of my instructor — and depending on whom you ask, it’s not necessary to invest in a pricey set of kitchen knives. But boy, are they nice to have around. After a while, I could really appreciate the heft, balance and weight of the Wüsthof knives, and the easy rhythms of steady cutting action that, when mastered, became almost meditative. The biggest challenge was unlearning old (bad) habits, so admittedly, it was slow going at first, but after a while, the techniques began to gel. So while I still don’t know how to wield a knife like Hung, winner of Top Chef Season 3, I feel I’m on my way, slowly, surely, to getting all the pieces the same size. And isn’t that really the most important thing? 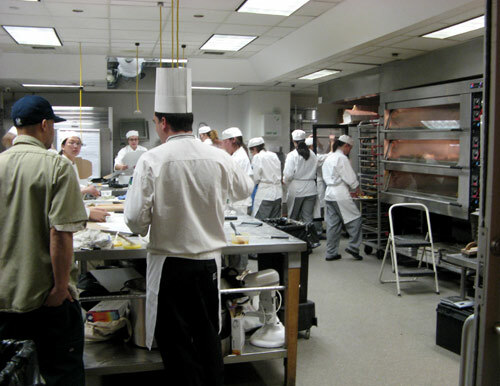 On the way out, lured by the warm, delicious smells, I peeked in on the baking class still in progress across the hall. The one downside to the knife skills class: no treats to take home afterwards… unless you count the errant flecks of shallot I found in my hair later that night. After weeks of conflicting schedules, CF and I were able finally to set aside an evening for our long-awaited guitar lesson, after which, she assured me, I would be able to play a song. Since I’d never so much as picked up a six string, the plan sounded ambitious, but I was game. Armed with my new knowledge, we flipped through the book CF had presented me with to encourage these new musical frontiers. Rise Up Singing claims to contain nearly 1200(!) songs, though that figure is just a little misleading: the format is what’s known in musical parlance as a “fake book,” which is to say, a collection providing the minimal information needed by a musician to make an impromptu, passable arrangement of a song. Enough to “fake it,” as it were. 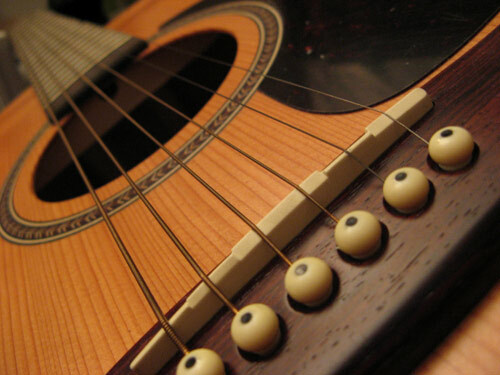 The format is intended to help a performer quickly learn new songs, and usually contains just a melodic line, lyrics and basic chords. Or in this case, just the lyrics and the chords; editors Peter Blood and Annie Patterson seem to assume that users will already know the tune to many of the book’s songs. I didn’t — er… “Rosebud in June (Sheep Shearing Song)“? — but out of the advertised 1200, there are certainly enough familiar ones to keep me busy for a good long time. To my delight, and just as CF had promised, I actually was able to play through an entire song by evening’s end. Not well, but almost… somewhat… barely recognizably. My finger pads hadn’t been so sore since my years of Suzuki violin. The song: “Leaving on a Jet Plane,” which was written by a 23-year old John Denver in 1967 during a flight delay at a Washington airport. Peter, Paul and Mary recorded the most well-known version of the song, which became their biggest (and final) single in 1969. Nearly three decades later, Canadian chanteuse Chantal Kreviazuk scored a minor hit with the version she recorded for the wretched Armageddon (1998). Interesting tidbit: Denver successfully took legal action against New Order over the song, claiming that the guitar break on the band’s “Run 2” (1989) — the third single off their “last great album” Technique — was based too closely on his “Leaving on a Jet Plane.” An out-of-court settlement against the British rockers ensured that their song would never be re-released in its original form. Here’s a shot of my beautiful Seagull S6—thanks again, friends and family! Yo-Yo Ma has his Petunia; B.B. King has his Lucille… What shall this one be? 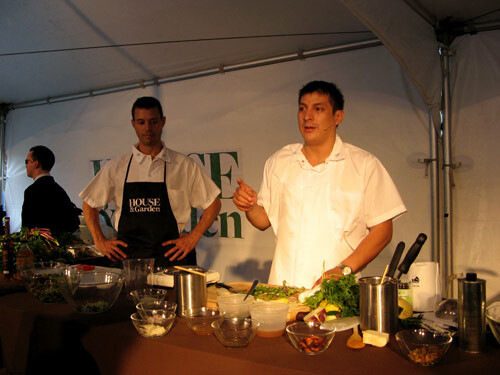 Today in Union Square, House & Garden was hosting free chef demonstrations as part of their week of “Design Happening” events. (Curious timing: two and a half weeks later, the magazine announced they would cease publication in December 2007.) 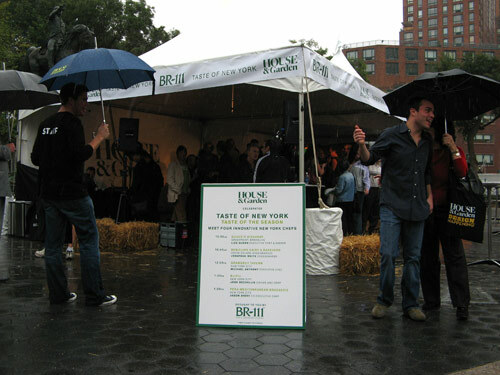 The website touted a promising midday lineup of neighborhood chefs: Liza Queen of The Queen’s Hideaway, Jonathan White of Bobolink Dairy and Bakeyard, Michael Anthony of Gramercy Tavern, Josh Dechellis of BarFry, and Jason Avery of Pera Mediterranean Brasserie. The weather, though, looked significantly less promising. By morning rush hour, dark clouds hovered overhead; whether the forecast rains would hold off until after lunch remained to be seen. Oh well. It’s just water. Mostly. DeChellis was born in Bogota, Colombia, raised in Clinton, New Jersey, and is best known for his innovative fusion-style cooking, which he honed at now-closed Union Pacific (where he was sous-chef under Rocco DiSpirito.) I’ve been a fan of DeChellis’ since his days in the kitchen at Sumile in the West Village, so I was pleased that his cooking segment coincided with my midday break. We arrived at the south end of the park just as he was beginning to demonstrate his “BarFry salad,” one of the few non-fried menu items served at his newly opened — and well–reviewed — tempura palace. Making full use of the Greenmarket’s beautiful produce, DeChellis employed a variety of lettuces and shaved vegetables — many of which were familiar to us from our weekly CSA shares from Stoneledge Farm. (Ah, great use for mizuna and celeriac!) Hewing closely to his signature flavor profiles, he also incorporated Asian pear and shiso; the minty plant (leaves of which he passed around for sampling) with its distinctive piney/licoricey aroma was the one salad ingredient not available at the Greenmarket. 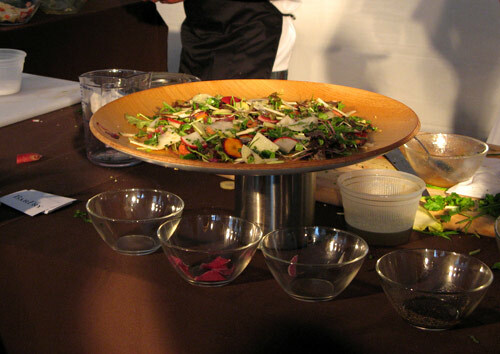 DeChellis gamely talked us through the paces of creating and plating a perfect salad as he answered questions from the audience. 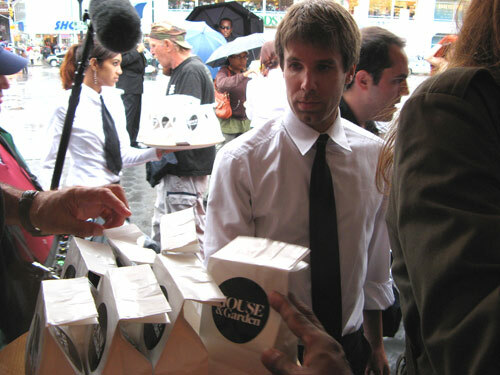 As he wrapped up his presentation, a server appeared with white waxy paper bags of DeChellis’ special recipe popcorn. Those who know me know of my deep fondness for kettle corn, and this was like a gourmet, Asian-spiced version of that: sugar, salt, toasted sesame seeds, crushed pumpkin seeds, nori powder, nori flakes and Korean chili powder. Outrageously addictive!